After a successful trial run of its GTX 6.5GHz UWB wireless microphone system last year at the US Open Tennis Championships in New York, Alteros, an Audio-Technica company, upped its game for 2018. Utilizing the enhanced range and flexibility provided by the new Alteros Direct-to-Fiber system, host broadcaster ESPN was able to quickly set up and cover multiple locations with Alteros’ great sounding interference-free wireless microphone coverage. 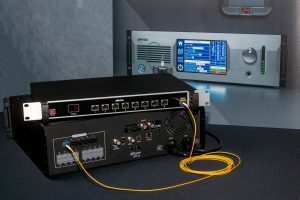 The standard GTX system allows up to 32 GTX32 transceivers to each be connected to the GTX3224 control unit with up to 1000 feet of Cat 5 cable, creating a L.A.W.N. (local area wireless microphone network) system to communicate bidirectionally with up to 24 GTX24 wireless microphone transmitters — 24 microphone channels and 24 talkback channels with an additional eight group channels. With the introduction of the GTX3224F, fiber connections measured in miles instead of feet can connect the control unit to GTX-FX8 8-port nodes for remote Cat 5 connection to up to 48 GTX32 transceivers (up to 16 GTX32s can be connected directly to the GTX3224F by Cat 5 for a total capability of 64), resulting in the ability to cover larger spaces and multiple locations. While the Direct-to-Fiber system would allow coverage anywhere within the Arthur Ashe Stadium (the largest tennis stadium in the world), three areas were covered with the Alteros GTX3224F system for the 2018 U.S. Open: practice court #1 and the broadcast sets at both the Stadium courtyard and practice courts. The Alteros GTX3224F main fiber control unit was housed in the safe convenience of the ESPN Technical Operations Center. Fiber then connected to the remote locations where GTX-FX8 8-port fiber nodes supplied control and power. The high-resolution audio remained uncompromised and fully digital — 48 kHz/24-bit — throughout the system.